We don't really have an off-season, per se, except the middle of the summer when everything just sort of sighs and either keels over dead or goes dormant for a month or two, but foliage and blooms can be a bit thin in the landscape in January and February, so I wanted a Camellia. So on my way home from taking a somewhat silly beekeeping class in Sebastopol this morning, I stopped at one of the many fine nurseries up there and bought myself one. This is the time of year to buy them, when they are flowering, so you can see what they look like in bloom. And here it is. I chose a variety called 'Tama Peacock' (inexplicably mislabeled 'Peacock Tam' by the nursery). It's a somewhat weeping variety, with semi-double flowers. A very striking tree. 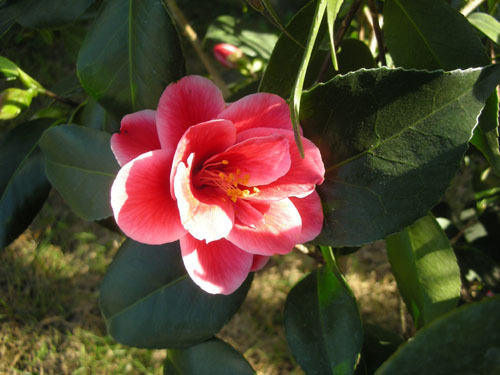 Camellias theoretically grow to be about 8 ft. tall, but can get very wide (horrid things happen when people plant them as if they were shrubby foundation plants; they are trees). So I planted this one in the shady driveway area between our house and the neighbor's. Then I top-dressed it with a sack of coffee grounds from Starbucks. And here is the blossom. A deep pink with white edges. 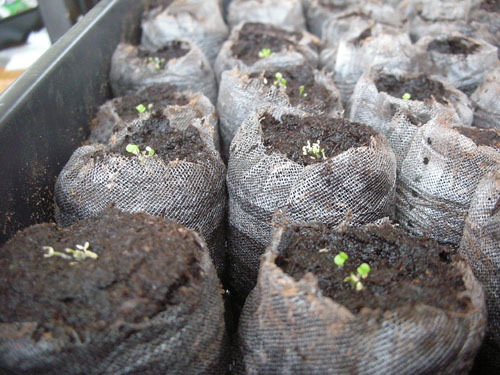 In other news, we have germination, at least for some of the seeds in the first batch. The Bellis perennis (English Daisy) are quite happy with conditions in the germination trays, I guess. 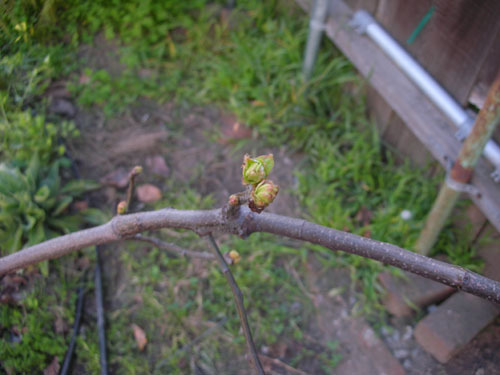 And further proof that spring begins in February in this state: we have bud break on the quince. If you're seething with jealousy, you know how I feel when I hear it's raining in Michigan in July. I'm just saying. 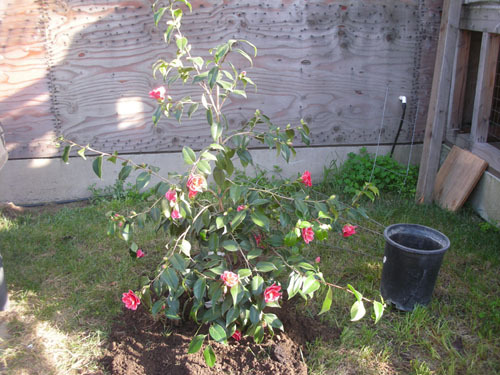 why coffee grounds for the camellia? And, do you pay for the coffeegrounds? Coffee grounds make the soil more acidic, and camellias like acid soil. Ours is fairly neutral to alkaline, because of the construction work (concrete leaches alkalinity into soil for ages after you put it in). Just top-dressing the sand with coffee grounds and watering will acidify it enough to make it comfortable for the tree. The coffee grounds are free, in bags. Our local Starbucks has them bundled up in a basket by the exit, and when I took some the girl told me they had tons more in the back. All Starbucks will give you grounds for free if you ask. Sigh, I know what you mean about the camellias. When we moved in there were two large, established camellias right in front of the front porch, being treated like shrubs. They're probably 7 feet tall and have grown into each other. Every year I have to prune them a couple different times, because they keep sending up branches which would completely block the light to the porch. They seem to take in stride, fortunately, but they really would prefer being trees, I think.